TEM and X-Ray Windows are packaged in silicone gel-boxes with their suspended membrane films facing up (see cross-section). The suspended membrane side of TEM and X-Ray Windows should never be placed onto another surface in the opposite "face-down" orientation. We recommend handling TEM and X-Ray Windows from the sides of their frames using flat-sided, K6-style plastic or teflon-coated tweezers. Do not directly touch the suspended membrane window. 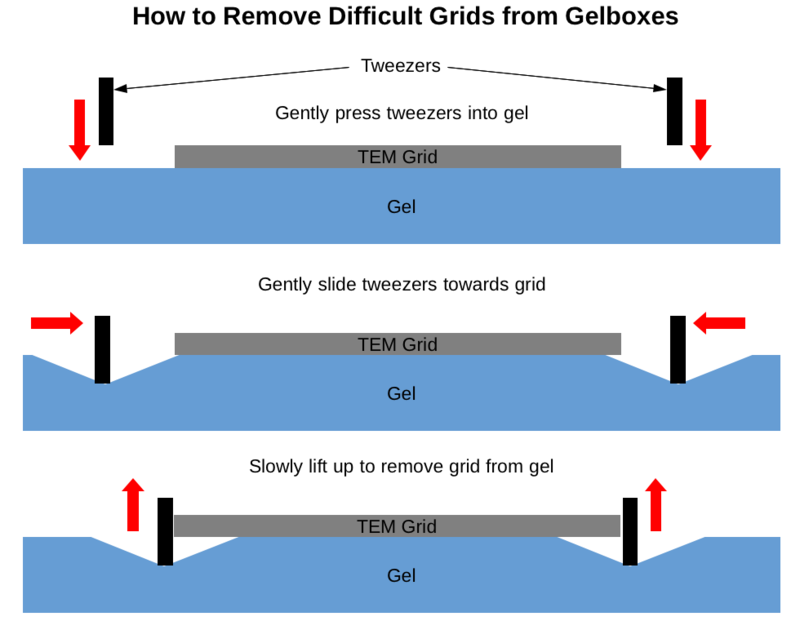 For best results when removing off the silicone gel-boxes, follow the technique shown in the figure (see below). TEM and X-Ray Windows are made of ultrathin, silicon-based films that are very robust when dry, but care must be used when wet. For liquid cleaning, most organic solvents are compatible (e.g., isopropanol, acetone, toluene, etc...). Water or dilute solutions of HCl or H2SO4 can be used. Silicon nitride films can be cleaned in basic solutions, but dilute/weak bases can only be used for pure silicon and silicon dioxide films for short exposures (<10 seconds). When introducing TEM and X-Ray Windows into a solution, the chip should be held vertically with tweezers. The chip can then be moved up and down in the cleaning solution. To rinse, transfer to distilled/deionized water using the same method. For plasma cleaning, we recommend using pure O2 if possible as Ar will degrade nanometer-thick films over time. Typical O2/Ar mixtures are acceptable. In general, silicon-based films can be cleaned for significantly longer (>60 seconds) than conventional carbon films, eliminating most organic contaminants. UV-ozone treatment is compatible as well. We recommend comparing a treated and untreated TEM or X-Ray Window when first characterizing cleaning protocols. If light microscope inspection reveals substantial change in color or wrinkling of the treated suspended membrane film, then conditions may be too aggressive and may have degraded the membrane film. We recommend following the system manufacturer's power settings. Note that pure silicon TEM Windows will oxidize in the presence of O2 at elevated temperatures and crystallize at >600 degrees C.
When applying a liquid sample, we recommend placing a small drop of solution and wicking away the excess with a clean laboratory or lens tissue. The specimen should be allowed to dry in a clean environment as rapidly as possible to minimize contamination. If adhesion or dispersion is not as desired, pretreatment by O2 plasma or UV-ozone can be used to increase surface hydrophilicity. The use of typical MEMS processes for depositing other thin films is compatible with most TEM and X-Ray Windows. We recommend avoiding highly stressed films and/or high stress mis-matches that may occur during high-temperature depositions. Spin-coating other films is compatible as well, but we recommend an appropriate holder that avoids direct exposure of the suspended membrane to vacuum during spin-coating. Temperature and differential pressure tolerances are available by visiting our Technical Info page on the left navigation bar. Please contact us with any questions or concerns.